We love simple meals that taste fancy. Something that you imagine you could order in a restaurant, because you can’t make it at home. It’s presumed to be too complicated, take too long, or not be worth all the work. The tangy tomatillos break down into a delicious stew, mingling with the onions, peppers, cilantro and spices to make a simply perfect combination. Everyone we’ve made this meal for loves it, and it’s naturally gluten, dairy and grain free. You can eat it like we do, as a perfectly yummy soup or stew on its own, or inside a tortilla shell (you can use almond flour ones for a grain free option). Another great way to enjoy this is on top of rice or cauliflower rice. Note: the longer you let this simmer, the more tender the chicken will be. Occasionally we will let it simmer for an hour, being careful to add more broth as needed. Sear chicken breasts until golden brown, 3–4 minutes per side. Transfer chicken to a serving platter. Add broth to skillet and bring to a boil, scraping up browned bits. Stir in tomatillos, onion, garlic, and jalapeño. 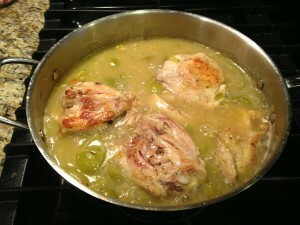 Reduce heat to medium and simmer until tomatillos start to break down, about 10 minutes. Return chicken breasts to pan and continue to simmer until sauce is thickened and chicken is cooked through, about 10 minutes longer. Season sauce to taste with salt, pepper, and lime juice. « Our back to school, gluten-free snack pack giveaway is live! 3 Pings/Trackbacks for "Tomatillo Chicken (gluten-free, dairy-free, Paleo)"
Tomatillo Chicken (gluten-free, dairy-free, Paleo) | Inspired Eats | Eat. Heal. Thrive.